The popularity of the Lord Yo Dining Chair catapulted a simple polypropylene and aluminum stacking chair to universal recognition. 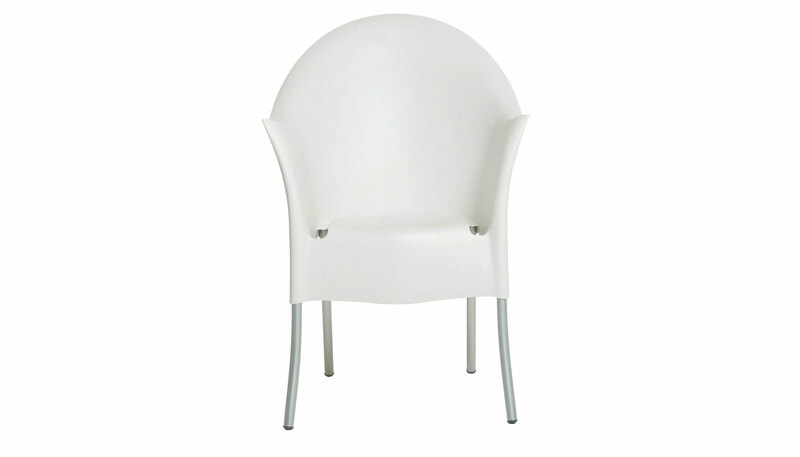 The chair's status is due to its soft curves and raised back resembling a throne accompanied by slightly bent legs. A novel idea is now proposed in providing a white slipcover that while hiding the chair reveals the nature of its iconic silhouette. The chair is suitable for indoor and outdoor settings. Available finishes include white, light gray, black, orange or red. The white and light gray versions are available with expedited shipping in our Quickship program. The chairs come in a packing unit of 4 pieces in the same color. Loose covers are available in white cotton or white piquet for an upcharge. Manufactured by Driade.